For the last 30 years, October has been National Breast Cancer Awareness Month and the tradition continues to grow each year. This is demonstrated by the numerous fundraisers and events hosted for this month in addition to the overwhelming sea of pink clothing and decorations that are seen in support of breast cancer awareness, both nationally and locally. According to the American Cancer Society, one in eight women in the United States will develop breast cancer at some point in their lifetime. The estimate for 2015 is that over 40,000 women will die from breast cancer this year. In 1985, National Breast Cancer Awareness Month was founded as a partnership between the American Cancer Society and Imperial Chemical Industries. Supporting their local philanthropy, Delta Zeta is hosting a Pink Out Carnival in Heritage Park at 6 p.m. on Oct. 21, with carnival games to raise money for Susan G. Komen for the Cure, and all proceeds go to the non-profit. “Delta Zeta hopes to raise awareness of the fight for breast cancer on our campus and to remember the people who have been affected by it,” said Delta Zeta Philanthropy Chair Cayten White said. 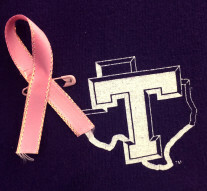 The Student-Wide Activities Team (SWAT) is hosting two events for Breast Cancer Awareness Month. On Oct. 19, from 12 p.m. to 2 p.m., the group is serving pink ice cream floats in the Tarleton Student Center and then on Oct. 23 SWAT will also be hosting their annual Pink Out Street Dance from 7 p.m. to 9 p.m. Participants are encouraged to wear pink. Currently, SWAT uses their events not to raise funds, but “just to bring more attention to the cause and to motivate people to try to help more,” said SWAT Campus/Community Outreach Chair Elizabeth Batten. However, Batten said that she hopes in the future events they will bring in the option for participants to donate as well. 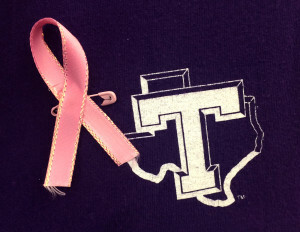 Healthy Woman in Granbury is hosting a breast cancer awareness event on Oct. 20 from 12 p.m. to 1 p.m. This event includes lunch, door prizes, local vendors, and a group of breast health specialists. There will also be an opportunity to schedule annual mammograms. The event is at the Granbury Resort Conference Center, and admission is $5 for members and $7 for guests. Some organizations treat every month like Breast Cancer Awareness Month. Moncrief Cancer Institute and UT Southwestern Medical Center partner with local medical facilities to provide uninsured women fully funded mammograms in Stephenville and Granbury every month. “We do what everyone else does for Breast Cancer Awareness Month all year long,” said Moncrief Cancer Institute Community Outreach Coordinator Liz Heck. There are screenings this month at Stephenville Medical and Surgical Clinic (Oct. 27, 28, 29, 30) and Lake Granbury Medical Center (Oct. 15). These screenings are important because, “early detection saves lives,” Heck said. Several local businesses are raising money for breast cancer. Dollar Tree is selling pink hats, water bottles, pens, hand sanitizer, pins and wrist ties—all for $1 each—with the breast cancer awareness ribbon logo on them. Also, Barefoot Athletics is selling pink shirts, hats and many other items; a portion of proceeds will be donated for breast cancer research.